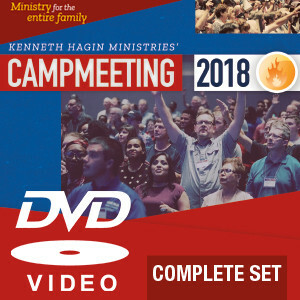 Experience Campmeeting 2018 any time in full color—almost like you were there! The complete DVD set includes all services on 16 DVDs packaged in an album. Host speakers are Kenneth W. Hagin, Lynette Hagin, Craig W. Hagin, and Denise Hagin Burns. Guest speakers include Charles Cowan, Mark Hankins, Darrell Huffman, Bill Ray, and David Shearin. Recordings are from Campmeeting services held on the Rhema campus from July 22-27, 2018.